If you’ve heard of pillar content, you likely know that pillar pages are long (1000’s of words), detailed site pages, that provide a comprehensive outline of a certain high-value topic, relevant to your organisation. You can see an example of one of our pillar pages, outlining ‘What is ABM?’ here. But why should any marketer consider investing in such a weighty content asset? What advantages and value can pillars drive, and how do they fit into your wider content and SEO strategies? Why Include Pillars In Your Content Strategy? When thinking about pillar pages, it’s important to recognise that they are much more than ‘a really long blog post’. While yes, a pillar page is a detailed, comprehensive guide to a particular topic - it also forms part of an in-depth SEO approach; a connected ‘topic hub’ or ‘topic cluster’ that details and links to a wide range of related assets. As a basic outline, a topic cluster helps search engines recognise that you are the authority on a particular topic. Essentially, a topic cluster consists of multiple pieces of content that outline an aspect of a wider central topic (such as our series of blog posts about different aspects of Account-Based Marketing). These related posts should interlink with one another - and in turn, interlink with a pillar page, that details all aspects of that topic from the top down. Here, your comprehensive pillar page forms the central topic ‘hub’ - around which you can create other topic-relevant assets that might explore aspects of the subject in more depth. With both your blog content and pillar page informed by, and optimised to include, relevant topic keywords, this interconnected hub of content ensures that search engines recognise and prioritise your authority on a subject. So - a pillar page is so much more than just a big blog post. Pillars can’t exist as stand-alone items; they must form part of a wider content and SEO strategy to drive value and be seen. And, done well, a pillar page has the potential to establish you as topic authority to drive substantial, relevant traffic back to your site. As an example of the results you can achieve with a well-planned, well-implemented pillar page, below is an example of how Strategic's 'What is Account Based Marketing' pillar page is performing in search results. 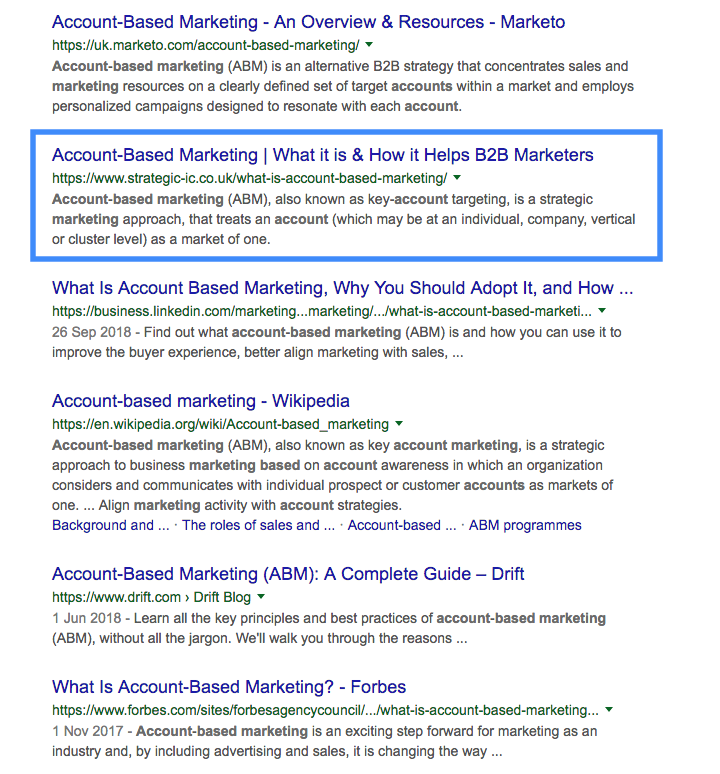 With the search term 'What is Account Based Marketing', we now see our pillar page competing with content from industry leaders such as Marketo, LinkedIn, Drift, Forbes, HubSpot and Wikipedia. Where Should You Start With Pillar Content? Creating an effective pillar page requires substantial time and resource investment. Planning is crucial when it comes to developing pillar content. You can’t just write a free-form essay on a topic, add a few links and a CTA and expect it to achieve results! Before you even consider writing, the first step is to develop your pillar content strategy, structure and process. Highlight relevant supporting content assets and blogs around the sub-topics (ideally around 8-22 other content assets) that should link to the pillar page (as well as identifying new opportunities for supporting sub-topic blog creation). It’s important to recognise that there’s much more to pillar page creation than planning, writing and designing the pillar page itself. 1. Have enough of the right supporting blog content to create a substantial content hub to link to your pillar page. 2. Can create (8-22) new supporting content assets to expand the sub-topics if you lack existing content - and publish them in line with your pillar page launch. Remember, everything needs to interlink! Note that if you’re using existing blog content to support your pillar page, these should be optimised (with older content updated) to align with your pillar page keyword research. 3. Write your pillar page! With the right pillar structure, SEO foundation and content plan in place, you should be in a position to write new required content, and optimise historical content accordingly. Remember, your pillar page itself will be a long-form (often upward of 4000 words) piece of content, designed to outline the top-level areas of your pillar topic, which itself targets a precise, high-volume keyword. The sub-sections of your pillar page should be informed by relevant, high volume sub-topics, and combine to create a comprehensive overview of the subject. Once the pillar is drafted, designed, and your content is in place on the page be sure to review the linking strategy behind it. Without the right cross-links between your supporting topic cluster blog content and your pillar page, search engines won’t recognise your authority around the topic, and your pillar will not perform as well. 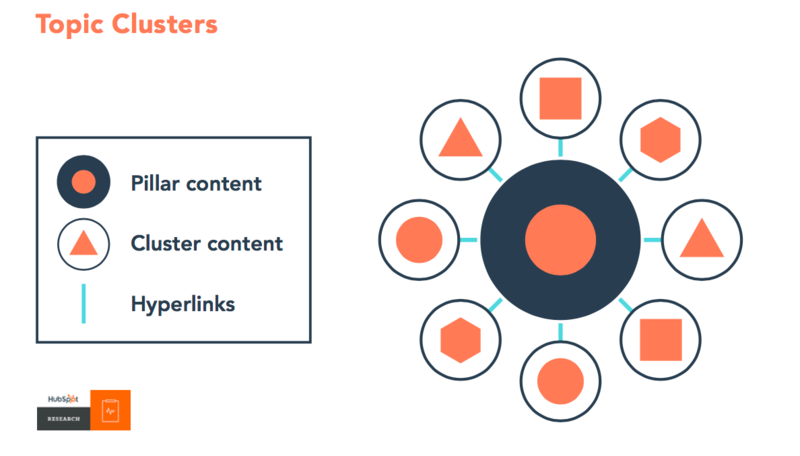 As planning, mapping and creating a wider pillar page and topic cluster can be complex, using tools such as HubSpot’s Content Strategy Tool for mapping topic clusters can help to clarify the process, keep all of your content (pillar and otherwise) aligned with your wider approach, and ensure your pillars will result in an uplift in traffic. With the right consideration, and ongoing optimisation, pillar content forms a valuable part of modern content strategies. Your content strategy and pillar strategy should run hand-in-hand; they support each other - and shouldn't be thought of as separate content tasks.